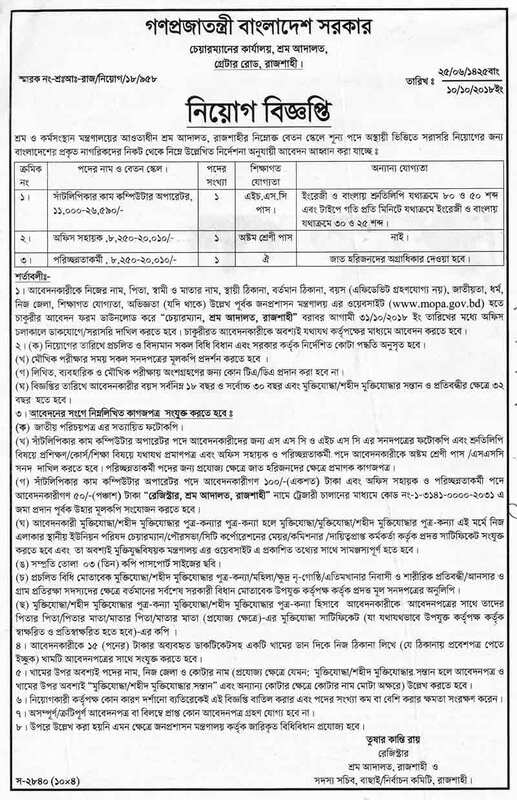 In the labor court of Rajshahi, under the Ministry of Labor and Employment (Mole), published the recruitment notice for appointment to manpower in vacant positions. Applications are being made from the actual citizens of Bangladesh. The company will appoint 3 posts. Both women and men can apply in the post. Full notification details were given. Other qualifications: 80 and 50 respectively in English and Bangla script, respectively, the speed of words in typing at the rate of 25 and 30 respectively in Bangla and English. Age: 18-30 years, 32 years in case of freedom fighters and disabled quota. Salary Scale: 8,250 – 20,010. Application deadline: Interested candidates will be able to apply till 31 October 2018.